Liberty University will welcome Vice President of the United States Michael R. Pence to deliver the keynote address at its 46th Commencement on May 11. Pence made the announcement himself to Liberty students on Friday morning via a video conference from Washington, D.C., to the university’s Vines Center, which was serving as a satellite location for the Conservative Political Action Conference (CPAC). "It is great for us to be back at CPAC 2019, the largest gathering of conservatives anywhere in America," Pence said. "I'm honored to be joined here by thousands of conservatives in our nation's capital, but I also want to give a shoutout to all those great conservatives watching across the country, especially all of our friends joining us live from Lynchburg, Va., at Liberty University — I'll see you in May." 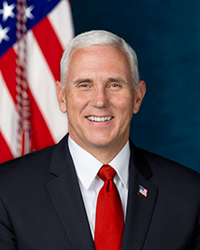 Commencement will mark Pence’s second visit to campus. He spoke in Convocation on Oct. 12, 2016, as then-Indiana governor and Republican vice presidential candidate. Pence practiced law early in his career and hosted a syndicated talk radio show and a weekly television public affairs program in Indiana. In 2000, he was elected to the United States House of Representatives at the age of 40 and served from 2001-13. On Capitol Hill, he established himself as a champion of limited government, fiscal responsibility, economic development, educational opportunity, and the U.S. Constitution. Pence was elected governor in 2013 and again helped to make government smaller and more effective, reduce spending, and return power to state and local governments. As governor, he also enacted the largest income tax cut in state history, increased school funding and expanded school choice, and created the first state-funded Pre-K plan in Indiana. He also made career and technical education a priority in every high school. He was selected as President Donald Trump’s running mate in July 2016. This year, the university expects to celebrate about 18,000 graduates. Liberty’s Commencement is among the most heavily attended events in Central Virginia. About 40,000 guests are expected to attend Commencement Exercises, which begin at 10 a.m. May 11 at Williams Stadium.